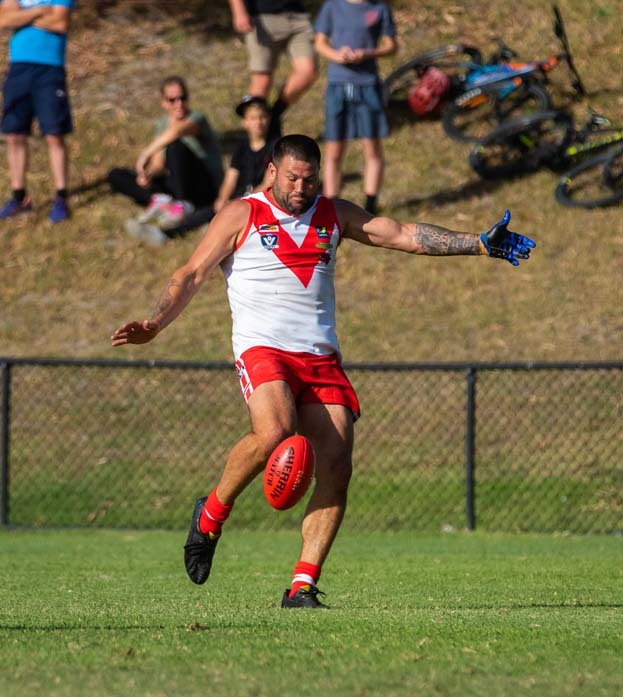 TYABB brought out the big guns on Saturday with AFL premiership winning forward Travis Cloke running out for a one-off appearance, but their Somerville opponents were out to spoil the party. For the Yabbies it was a day of wasted chances, as they struggled to hit the scoreboard and convert their opportunities into goals. Somerville flexed their own forward line muscles away from home, with Paul Fermanis and Ryan Gillis both booting four. Despite the help from their former Collingwood star, Tyabb fell to defeat 11.16 (82) to 14.18 (102). Cloke kicked two for the day. Karingal’s superstar forward recruit had a better day at Chelsea Reserve, booting five majors to help his side to victory against Chelsea. Marc Holt backed up his bag of seven from last week with a bag of five this time around, taking his tally for the year to 16 from three games. The Seagulls were competitive and held the lead going into the final break, but the Bulls proved just too strong and ran away with it 11.7 (73) to 13.10 (88). The win is the Bulls’ third from three games, as they look one of the firm favourites to fight for the premiership this season. At Belvedere Reserve, Seaford secured a huge win over Langwarrin to keep up their fight for promotion back to division one. The Tigers put a competitive contest to bed by tearing the Kangaroos apart in the third quarter. Aaron Walton and Sam Lonie were big contributors for the winning outfit, putting through four goals each to help their side to a 15.16 (106) to 7.11 (53) win. Around the grounds, Red Hill fired a warning shot to the rest of the competition by scoring a ruthless and dominant win over Pearcedale. Pearcedale were helpless against the dazzling Red Hill, with the scoreline reading 96 to zero midway through the third term. Red Hill were out to make a statement, and the flow of goals never stopped. They claimed the win 24.25 (169) to 2.3 (15). Last year’s grand final losers proved they have what it takes to go one better in 2019. Jonathon Ross scored five goals for the Hillmen, while Harry Wynn-Pope and Jake Mold also had dominant displays. Things were much closer at Glover Reserve, as Devon Meadows clawed over the line against Crib Point. With the lead at each break of play standing at less than a goal, the Magpies stayed right in the contest until the end. Devon Meadows secured the four points as the final siren sounded with the scoreboard reading 9.14 (68) to 9.3 (57). Playing away from home against Rye, Hastings secured another big win to go two from two in 2019. Star recruit Brendan Fevola has yet to pull on the jumper for the Blues, but that hasn’t stopped them from hitting the ground running this season. Their win takes them up to second in the ladder, only behind Karingal because the Bulls have played an extra game. Luke Hewitt and Taylor Stratton shared the goal kicking responsibility for Hastings with three each, as their side got the best of Rye 8.10 (58) to 11.15 (81).